Last week, Sony launched its VR headset, the last of the 3 major tethered HMDs (head mounted display) to release in 2016. This is a perfect opportunity to have a look at the media coverage around the launch and to see how well it has performed compared to the other two. If you have read our blog post on the VR in media report, the result shouldn’t be very surprising, though. 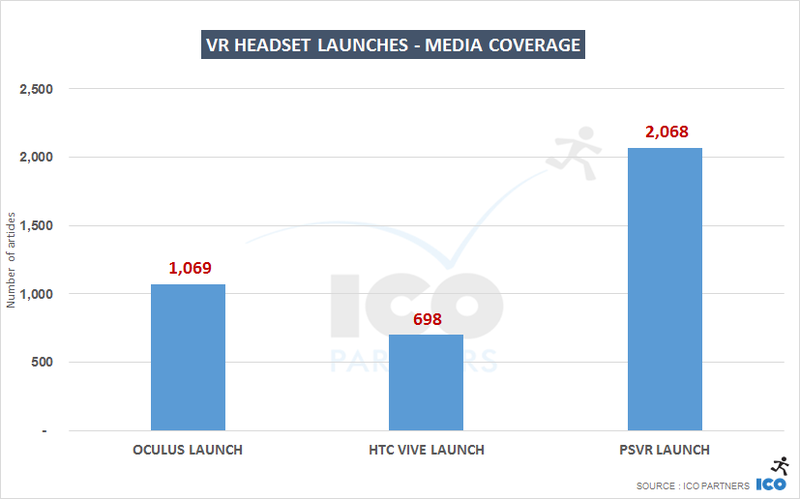 To compare the launches, I looked at the 48h cycle around the official release of each headset and the number of articles gathered for each device. 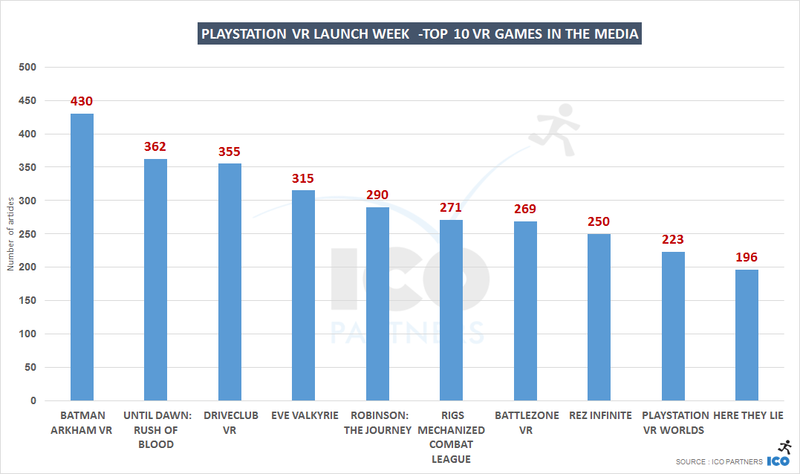 Sony is a lot better organized in regards to its PR, especially where games and technology media are concerned, and the results shows, with twice the coverage that Oculus had for its launch, that was itself better covered than the HTC Vive’s launch. But even then, the magnitude of the difference is really impressive. Oculus was first to market, in a highly anticipated technological advancement. A first explanation can be found with the languages breakdown. It seems Sony has been way better at engaging with non-English media than both Oculus and HTC were. In English, the PlayStation VR is 37% bigger than Oculus’, where in Italian – the biggest gap – it is 249% bigger. This said I don’t have any good comparisons with other, different hardware launches. The Xbox One S was launched in the middle of the summer with little fanfare, and it is arguably not a very significant launch (667 articles for its launch if you are curious). I guess the NX launch will be the next similar event that we can compare these numbers to. 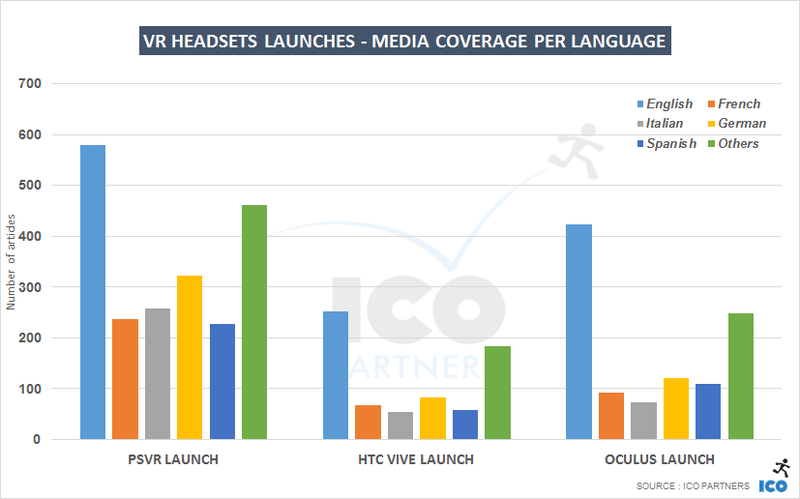 it is good to note as well, and that’s true for all three HMDs, that the launch is not the biggest media beat of their lifecycle. 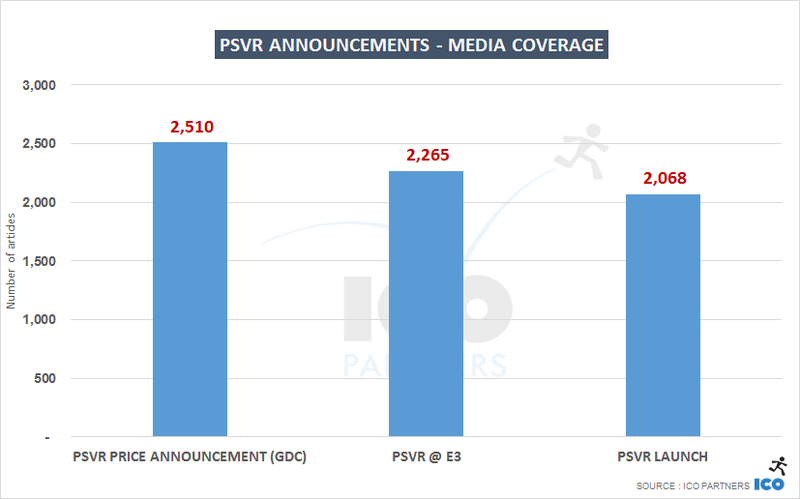 For example, for the PlayStation VR, the price point announcement earlier this year at GDC and the E3 coverage were both more significant when it comes to the volume of media coverage. With the launch of the new headset, a slew of VR games were part of the story. To cover the communications, that were spread across the week, I looked at their coverage for the whole of last week. Most of the articles were on the day of the PlayStation VR release or the following day. The odd one out in this top 10 is Robinson: The Journey. The game is not available yet on PSVR, but they announced they release date right around the PSVR release, getting a lot of attention thanks to that timing. The Batman VR game has been getting a lot of coverage, the brand power probably helping it a bit. This game still has the best performance, getting more coverage than Sony’s first party titles Until Dawn and Driveclub. EvE Valkyrie is also very well covered, especially for a game that has already been released on Oculus months ago. 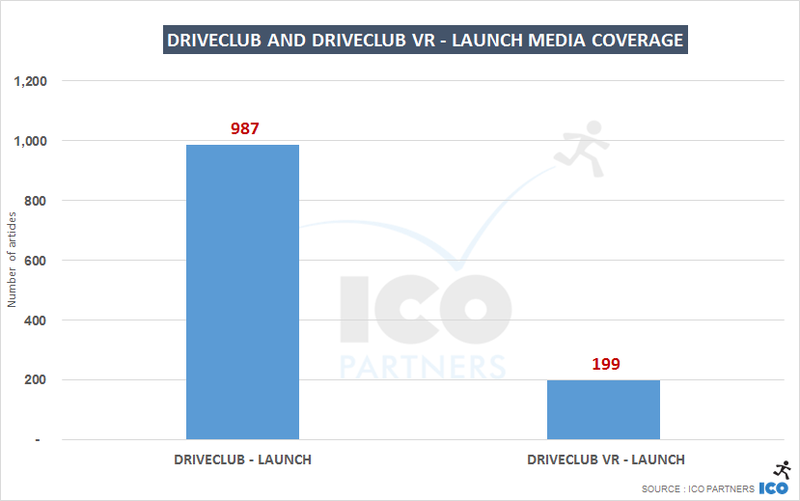 These seem like good numbers for games launches overall – however, when looking at established IP’s going into VR such as Driveclub, the numbers are still lagging behind. These are the early days of VR, and it doesn’t seem like a bad start, but there is a long way to go still to get a proper foothold in the media. We can expect this to grow alongside VR adoption. Meet the whole ICO team at gamescom.